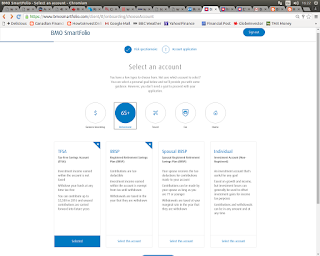 BMO's SmartFolio was officially launched Monday January 18th. Thus, one of Canada's major banks has finally entered the automated ETF portfolio investing space but its offering, while slick and convenient, needs improvements on costs, portfolio construction, client assessment and account types offered. 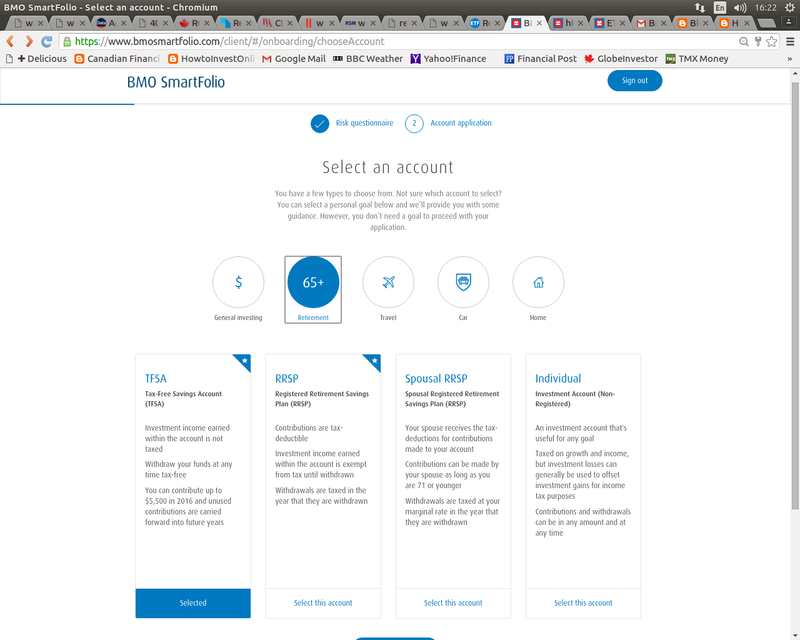 SmartFolio appears to be a "good-enough" offering trading on the solidity and trustworthiness of BMO's name, instead of being the leading edge product, in order to prevent customer leakage to competitors like Wealthsimple, National Bank, Canadian ShareOwner and others..
Higher Account Fees - The account management fees are a bit higher than competitors like Wealthsimple and WealthBar as the wire story on the new service says. The 0.1% or so extra may not seem like much but it adds up over the years. For instance, a $100,000 lump sum invested at 5.0% vs 5.1% results in a difference of about $8,000 more ($346k vs $338k) for the higher return after 25 years. But the key question for BMO (and all the robo services), is what do you get for fees of 0.7% on the first $100k invested, scaling down to 0.4% on the assets over $500k (see BMO's disclosure document here)? Is it really worth the money given the inexorable reduction in net investor return from fees? Not using Lowest MER ETFs - Another bit of extra drag on net investor returns will come from the embedded fees of the ETFs within the portfolios. First, instead of using the broad array of ETFs available in Canada, BMO has stuck to its own ETFs, which in some cases charge higher MERs than equivalent alternatives. Forgetting the KISS (Keep It Simple Stupid) principle - Second, the portfolios include multiple (up to five) different bond ETFs that put together more or less amount to the broad bond market. Why bother with several when there is likely, in total, to be little or no difference with a single broad market bond ETF? Is this just a marketing ploy to make investors think some sophisticated strategy is going on? The Income portfolio (30% equity, 70% fixed income) has on the fixed income side Canadian Mid Provincial Bonds (MER 0.25%), Short Corporate Bonds (0.12%), Mid Corporate Bonds (0.30%), Long Federal Bonds (0.2%) and USA Mid Corporate Bonds hedged to CAD (0.25%). The weighted MER will exceed 0.2%. This is more than BMO's own broad bond ETF (symbol ZAG) with its 0.2% MER. Worse, SmartFolio could have opted for Vanguard Canada's broad bond ETF (symbol: VAB) with a 0.14% MER or the even cheaper iShares offering named in the conclusion below. There goes another constant 0.1% drag on returns for the investor. An oddball Fixed Income holding - Finally, why include the USA Mid Corp Bond ETF (symbol ZMU) at all? It is the largest chunk of all the fixed income side in the portfolios. The inefficiency of the CAD hedging operation introduces a significant return drag on top of the higher MER that appears to total about 0.5% per year based on the gap between the index return and fund's NAV return. The reasoning for its inclusion no doubt is higher yield than equivalent credit risk Canadian bonds. However, the credit quality is much poorer; despite being 100% investment grade, is nowhere near the quality of VAB. ZMU has about half its bonds in the lowest investment grade of BBB and only 2% in the highest AAA group while VAB is the opposite - 48% in AAA and only 8% in BBB. In my view the role of bonds in a portfolio is safety and stability. The active management by BMO in picking ZMU is not appropriate, especially when one of the SmartFolio portfolios is named "Capital Preservation". No real return bond holding - I would suspect, or hope, that it's because the portfolios are meant to be good-enough for any type of account (non-reg, TFSA, RRSP etc) that one of the best diversifiers - real return bonds - is not included in any portfolio, not even the capital preservation account where such bonds' inflation matching properties would be extremely valuable. The problem is with taxable accounts since the inflation ratcheting of the principal is subject to annual taxation, despite not being received till many years later at maturity. No tailoring of ETFs to account type - The real return bond issue is a symptom of the good-enough approach. There's no tailoring to factors related to account taxation. As I documented in detail on HowToInvestOnline in ETF Asset Allocation across RRSP, TFSA and Taxable Accounts, foreign witholding taxes significantly reduce returns for certain ETFs depending on which account holds them. The ideal robo-advisor should tailor overall portfolios across account types and advise clients with this tax maximization knowledge embedded in it. No Real Estate at all - None of the portfolios includes any real estate REIT ETF. That's a standard part of any but the most basic portfolio. Low Volatility Equity a plus - On the plus side, BMO has chosen to depart from using only cap-weighted equity index funds by using its Low Volatility ETFs for part of the Canadian (symbol ZLB) and the US holdings (symbol ZLU). As I have related on HowToInvestOnline, the research says the low volatility strategy works. Why use specialized ETFs? - But why put in the equity portfolios a couple of specialized ETFs - the USA High Quality Index (symbol ZUQ) and the Developed market Global Infrastructure fund (symbol ZGI)? Basic good-for-anyone portfolios should use broad asset class ETFs, not specialized ones. The specialized ETFs also have higher MERs. No Emerging Market equity in most of the portfolios - Only the two most equity-laden portfolios (70% equity and 90% equity) include any Emerging Market at all. Insufficient range of account types - SmartFolio doesn't (yet?) offer the full range of account types. Notably and critically absent are RESPs and all the post-retirement types like LIFs, RRIFs, LRIFs. This factor makes SmartFolio an impossibility for me. SmartFolio is for younger non-retired people only whose goals do not include education investing for kids. Too little account choice advice - The start-up questionnaire provides no input to suggesting what type of account the investor should choose. It's only use is risk assessment to select one of the five model portfolios. The next step is to choose which type of account to create - TFSA, RRSP, Spousal RRSP or Taxable. The screen capture image below is the only guidance provided. The online chat person accessed through a click button can only give general advice and can provide no guidance on tax choices. Bottom Line: I'm not trying to pick on BMO, because all the Canadian robo advisors appear to have similar offerings, but considering the extra robo fees / costs and the feeble amount of personal situation tailoring carried out, the robo solution is just not worth it. Investors would be better off in a self-directed account in the two-fund Lifelong Portfolio, which puts half the invested money in each of a broad market equity ETF, like the iShares S&P/TSX Capped Composite Index ETF (TSX symbol XIC, MER 0.06%) and a broad bond fund like the iShares Core High Quality Canadian Bond Index ETF (symbol: XQB, MER 0.13%). In early 2015 I considered the other robo-advisers but found they too had overly complicated ETF portfolios and nebulous benefits vs their fees. I got out of the TD Strategic Managed Portfolio that was costing me $1000+ per month and went with the DIY ETF investing model using a few Vanguard and BMO ETFs through TD Direct Investing. I'm 100% happy and confident. I only wish I hadn't bought the BMO Laddered Preferred Shares ETF (ZDB) in my cash account-down 25%! Marko, I might consider the preferred share ETF (ZPR is the symbol, if that's what you meant) in my portfolio as an income-producing asset to be kept indefinitely. As long as the ETF produces its steady constant (noting the likely decline as the reset type issues renew at current lower rates) stream of dividends, I'd be happy. The annualized distribution yield of almost 7% is pretty attractive. The capital value would, for me, be secondary. Note that I am now retired, so income production not capital accumulation is the main aim of the game for me.